Great review! This doesn't look like it's my kind of book, but your review really encourages me to pick it up. I'll have to check this one out. Thanks! Great review. I'm already convinced I need to read this book, but it's always good to be reaffirmed. Lovecraft is a guy who is hard to get excited about, solely for how dated the prose feels. I've found audiobooks help a lot. I think there's a podcast called H.P. Podcraft that helps, but there's probably a bunch of his stuff on places like podiobooks or Libravox. I'm not a big horror reader, but this sounds like it might be interesting. Great review! 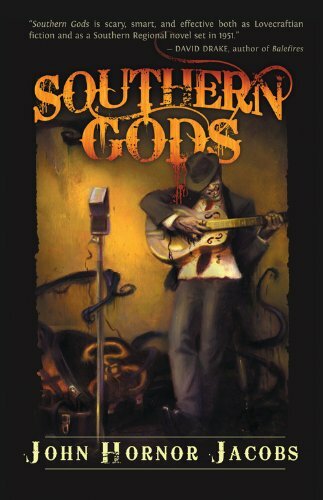 Southern Gods doesn't seek to be my type of book, but there is so much about it that appeals to me. The mystery, the creep factor, and the setting. The fact that some of this takes place in Arkansas definitely piques my interest. I will definitely keep an eye out for Southern Gods. Great review! Gef - Thanks for the Lovecraft info. I did download some Libravox recordings yesterday so maybe I'll start there. I will definitely check out the Podcraft and see if that helps. You're the best. I'm going to read this one, too. A few people I trust have said it's a great story and original. Right up my alley! Great review, Jen! Just found this post again...I really want to read this. I met this author at the airport leaving World Horror Con. He was extremely nice.